On April 3, 2013 Missouri’s Secretary of State of the State submitted a Petition for an Order to Cease and Desist and to Show Cause against Morgan Keegan over taxable municipal bonds Morgan underwrote for the City of Moberly in July 2010. The petition is available here (PDF) and the Offering Circular for the bonds is available here (PDF). The story has been picked up by The Bond Buyer and Law360. Setting aside the Petition’s allegations, the trading in this set of bonds highlights markup abuse we have found is rampant. Trading in these bonds (and hundreds of thousands more) can be viewed at the MSRB’s EMMA website. Trading in one of the Moberly bonds underwritten by Morgan Keegan can be found here. We excerpt some of the trading in the following table. The $3,025,000 par amount in this series was sold to investors in the offering. There was no further trading until October 21, 2010 when two positions totaling $1,110,000 face value were sold to a dealer (or less likely to two different dealers). This dealer then sold the bonds to investors over the next four weeks for $1,143,090 – a $33,090 or $2.48 average markup over the $100.50 paid to the selling customers. Setting aside for another day whether the markups charged in total were excessive or not, three trades call out for special appreciation. 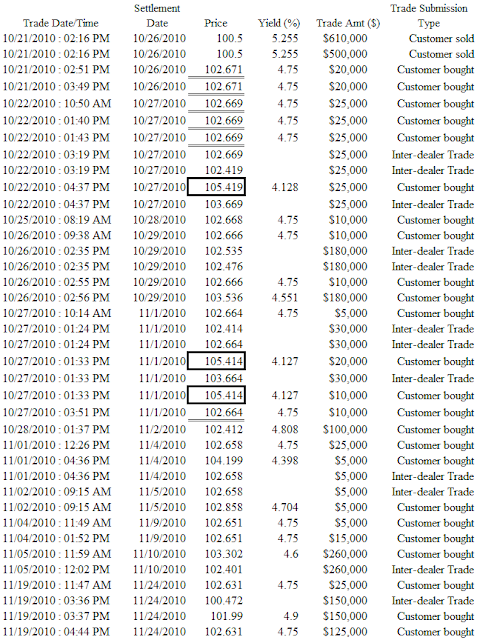 On October 22, 2010 a dealer charged a customer $105.419 for a $25,000 trade despite three other customer trades for $25,000 the same day at $102.669 and two trades for $20,000 the day before at $102.671. The $105.41 price was clearly unfair and the markup charged excessive. It appears the same dealer a few days later made sales of $20,000 and $10,000 at $105.414 despite a sale of $10,000 at $102.664 the same day. 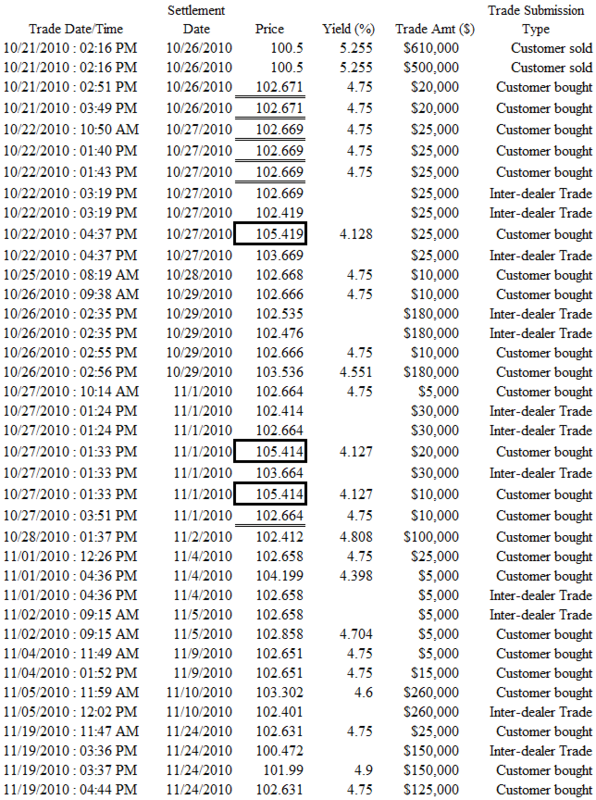 The $105.414 charged twice on October 27, 2010 was unfair and the markup excessive. We wonder whether the SEC, the MSRB, FINRA or the Missouri Secretary of State has looked at the trading in the City of Moberly bonds. We think this trading is illustrative of excessive markups and the ease with which the public and other non-public data would allow regulators to identify unfair prices and excessive markups.